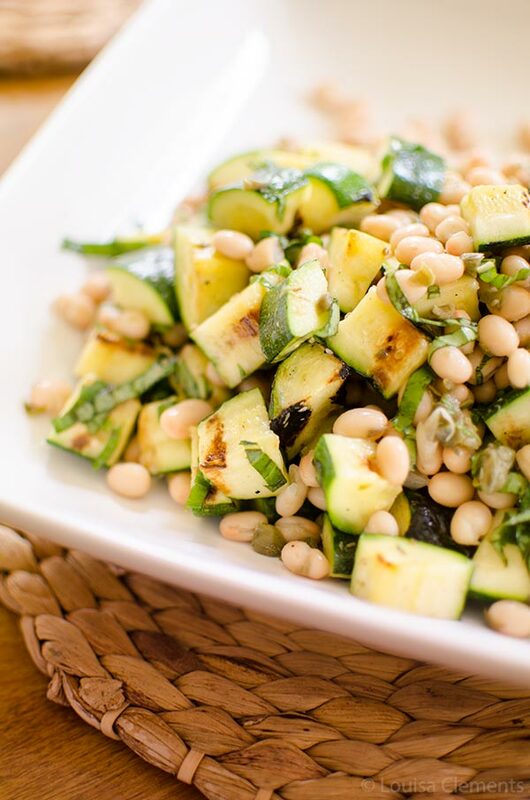 Enjoy bright summer flavours with this healthy, vegetarian and gluten free grilled zucchini salad that is packed with fresh basil, white beans and capers. 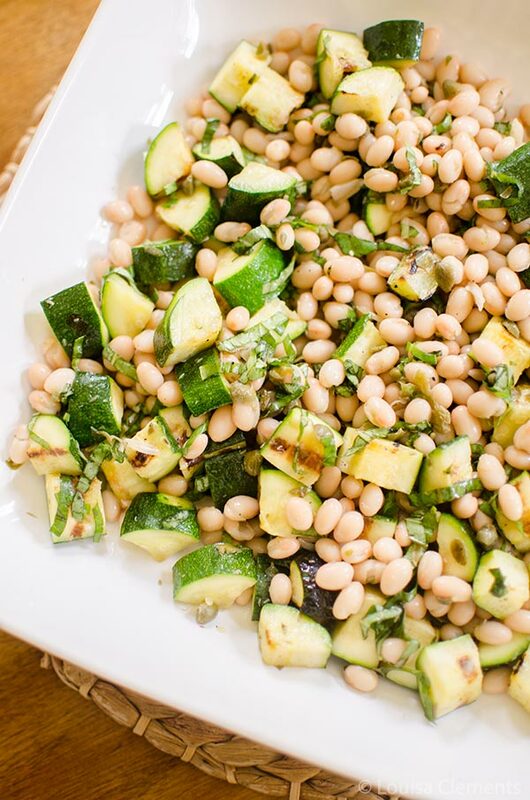 Grilled zucchini, basil and white beans – this salad is basically summer in a bowl. Ok, maybe not the white beans, but bear with me, a little protein in your salad never hurt. Oh, and I almost forgot about the secret ingredient in this recipe that really adds a little je-ne-sais-quoi: capers. Those little briny bites are the special, last-minute addition that took this salad from “yum” to “wow-I-can’t-stop-eating-it”. As a recipe developer, I love that moment. The moment when you’ve got the ratios perfect and the balance just right where it needs to be. It usually takes a few tries, for example, this salad started out as a refreshing, light salad with cucumbers instead of zucchini. It’s kind of funny the way recipes can start out one way and end up somewhere completely different. I’ve decided that recipe developing is like a microcosm of life. 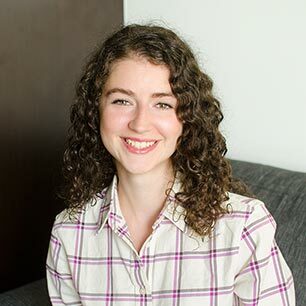 Things start out one way, or down a certain path and suddenly, you close your eyes and are at a completely different spot and going in a completely different direction. With recipes it’s often a little more deliberate (like how the beginning stages of this salad had fresh mint instead of fresh basil), but with life, sometimes it’s not so deliberate. I can’t get enough of basil right now, I’m putting it in everything. Plus zucchini and basil is one of those perfect flavour combinations, and one that I’m quite a fan of. I’ve made zucchini fritters before, which was my first foray into this lovely flavour pairing. While zucchini and basil might be a classic combination and one that is really popular, there are some flavour combinations (like chocolate and orange) which are equally as popular (if not more so) that I just can’t get into. Maybe one day. ‘Things have been a little quiet here, I think it’s safe to say that not many of you are on the computer during the summer. Why would you be when you could be outside having a picnic or eating a popsicle? Seriously, being outside and enjoying the summer weather is the only thing that has been on my mind recently. It’s been so hot in Toronto that anything that requires turning on the stove is pretty much out the window. That’s why this grilled zucchini salad is the perfect salad recipe for the dog days of summer. Just fire up the grill, throw your zucchini on there and toss with white beans, basil and capers. You’ll never believe how simple and delicious this recipe is, but that’s why I’m here to share simple, fresh and flavourful recipes. Fire up the grill for this healthy and light grilled zucchini salad packed with flavours of the season like fresh basil and protein from white beans, this salad is a crowd-pleasing side. Preheat grill to medium, toss zucchini with 1 tbsp olive oil. Grill for 8 minutes, flipping halfway through. Remove and slice into 1/2" pieces. Toss grilled zucchini with white beans, basil, 2 tbsp olive oil, capers and lemon juice. Get grilling this week with this healthy and simple recipe for grilled zucchini salad. This was really delicious and so easy to make! THANKS! Thanks, Anthia! Glad you enjoyed it.